This Amethyst and Diamond Cocktail Ring in 14K White Gold has a personality that's regal, but that's always ready for a good time. A striking violet gemstone and over a third carat of diamonds work together to create a style that's uncomplicated and always elegant, but that's never too uptight to have fun. 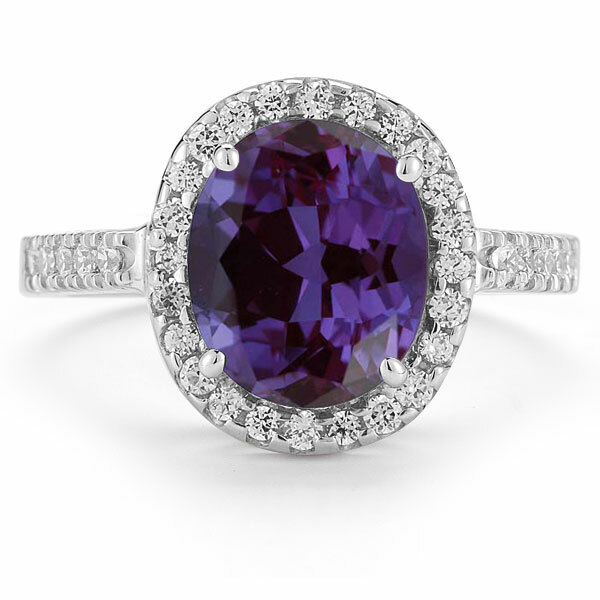 A richly-colored amethyst, 10mm high and 8mm wide, is the focal point of this glamorous ring. 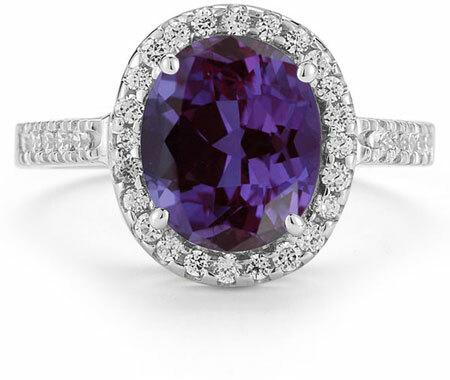 This sizeable gem has a saturated purple hue that has long been associated with royalty; this eye-catching color provides this ring with a look that's fit for a princess, but that's more than accessible for any woman with an eye for glamorous style. A total of 34 diamonds accent this eye-catching amethyst, two dozen of which surround this violet stone with a halo of sparkle. These colorless gems contrast beautifully with the rich color of the center stone, allowing this ring to catch the eye in an instant. On either side of the amethyst and its frame of sparkle are 10 additional diamonds (five on each side) that stud the slender band with additional glimmer. With a setting of cool, shining 14K white gold, this cocktail ring is classy and bold. We guarantee our Amethyst and Diamond Cocktail Ring in 14K White Gold to be high quality, authentic jewelry, as described above.